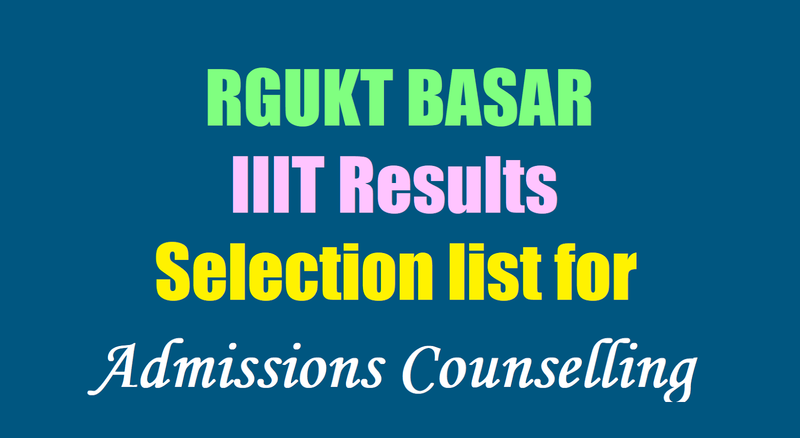 BASAR IIIT Results/ Selection list , Admissions Counselling dates: TS RGUKT Basar IIIT Results, TS IIIT BASAR Selection list for B.Tech Admissions 2018, #Basar IIIT B.Tech Admissions Shortlisted list, IIIT BASAR Results, Selection List, Shortlisted list for IIIT BASAR BTech Degree admissions 2018, BASAR RGUKT UG Admissions 2018 Selection list, RGUKT IIIT 6 year B.Tech Degree Admissions 2018 Results: IIIT BASAR RGUKT Admission Notification 2018 has been announced by the Rajiv Gandhi University of Knowledge Technologies Officials in April 2018. RGUKT invited the online applications from the eligible students for admission into first year of 6-year integrated B.Tech Degree programme for the year 2018-2018 being offered at the university constituent institutes at Basar. 5% supernumerary seats are also available for the students belonging to States other than AP and TS including the Children of Indian Workers in Gulf Countries / International and NRI students. RGUKT BASAR IIIT Selection List to be released on 16-07-2018 by the RGUKT Admissions 2018 officials. Now counselling for shortlisted candidates in the open and RGUKT IIIT Selection list of Candidates for selected for admission into first year of its 6 year B.Tech integrated programme 2018 at RGUKT located at basar. 16-07-2018: నిర్మల్ జిల్లా బాసర ట్రిపుల్‌ ఐటీ కళాశాలలో 2018-19 విద్యా సంవత్సరం ప్రవేశాలకు నాల్గో జాబితాను అధికారులు విడుదల చేశారు. మిగిలిన 33 సీట్లకు చెందిన జాబితా విడుదల చేశారు. వీరికి ఈ నెల 20న కౌన్సిలింగ్ నిర్వహించనున్నట్లు అధికారులు తెలిపారు. గ్లోబల్ సీట్లలో 75 సీట్లకు గానూ 25 సీట్లు మిగలగా.. వీటికి ఈ నెల 19న కౌన్సెలింగ్ నిర్వహించనున్నట్లు పేర్కొన్నారు. జాబితాను వెబ్‌సైట్ rgukt.ac.inలో పొందుపర్చామని తెలిపారు. We have known very well how the career graphs increases, if we enter in to IIT, III TS because future is with them. The students with perfect outcome will glitter like stars and leads luxurious life. But this skills, outcome depends on the institution that we choose. So, parents are worried about their children either they will achieve seats in better colleges. This RGUKT mainly helps backward, rural area, govt school children. So, they should utilize this golden chance. The merit list of BASARA RGUKT to be released. Where each campus have 1000 seats out of 1000, merit list of students to be released in Telangana. Counselling will be conducted for selected students, and for special category children in July last. Selection List for General Counselling Schedule/ IIIT RGUKT Results, Selection List/Shortlisted list for BTech Degree admissions 2018. Note: The claim of registered applicants whose GPA has been further improved in recounting / re-verification process of X class results, may be considered under waiting list upon submission of their improved grade sheet and certificates on or before 19th June 2018. We are happy to inform that you have been provisionally selected for counseling for admission into 6 -Year Integrated B.Tech Programme of Rajiv Gandhi University of Knowledge Technologies (RGUKT), Basar for the Academic Year 2018 -19. I. You are instructed to report at Venue of counseling i.e., at RGUKT (IIIT) – Basar, Basar Mandal, Nirmal (District), on ..."See in your clall letter" at 10:00 AM., along with the original documents/certificates mentioned below, without fail. It is the responsibility of students/parents to make all suitable travel arrangements so as to reach the University by 10.00 AM on the above said date(s). Admission shall not be given, if the student fails to attend the counseling in person on the above date and time for whatsoever reason. The seat will be allocated to the next best candidate. II. Mere attending the counseling does not guarantee a seat. The admission will be given only if the candidate fulfill all the eligibility criteria and pay relevant fee after the verification of original certificates / documents. The selection stands cancelled in case candidate fails to produce the original certificates mentioned below at the time of verification or fail to pay the relevant fee. 4. Conduct Certificate from 4th to 10th class. 5. Transfer Certificate (TC). However in the event of already taken admission elsewhere, the candidate can be given time to produce TC within four days giving an undertaking to that effect and the admission will be withheld. The following is the fee structure for each student who is admitted under Global category into 6 – Year Integrated B.Tech programme of the University. The candidates selected for admission shall be prepared to go through the intensive learning programmed at the RGUKT, and will have a fruitful learning time there leading to a bright career. The candidates selected for admission after counseling need to sign a declaration concerning the rules and regulations of the RGUKT at the time of admission. Note: This selection is for counseling and as such does not guarantee admission to the course. Admission to the course will be given subject to verification of all of your original documents.